A/C Ocean View, minutes from Beach with Turtles, Dolphins. 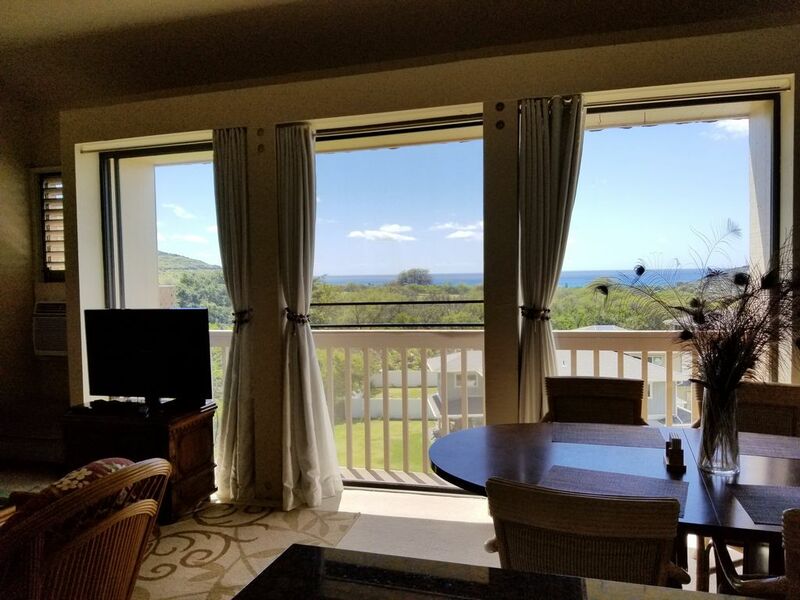 Excellent views of Makaha Beach and the Waianae Coast Mountains. The Plantation's Beautifully Manicured Grounds, 2 swim Pools, 2 Jacuzzi tubs, Basketball & Tennis courts. 5 minutes from world renowned Makaha Beach. For your comfort we provide comfortable Tommy Bahama Lawn Chairs,Oversized Umbrella, snorkeling equipment and books to help sightseeing. Basking Turtles are seen almost daily at Aki Beach and if you are lucky you can swim with turtles and Dolphins off the reef at Makaha or Pokai Beach. Golfers will find the golf course exceptionally beautiful and inexpensive. Clubs are available to rent. You and your guests may sit down to your delicious home cooked Meal around our large table that seats 6 or more or just work a Cross Word or Jigsaw Puzzle. Two flat screen smart TV,'s with Netflix capability in living room and bedroom. Ceiling fans in all rooms and air conditioning, if needed. Further Details: Each room has a ceiling Fan that works in combination with the louvered windows, to cool each room allowing the Trade Winds to gently blow through the condo in typical Island Fashion. Bedroom: King Size bed, 2 Side tables with lamps, Dresser with a 32'' Flat screen TV and room size air conditioner. Bedroom 2: 2 Twin Beds. All our walls are tastefully decorated with Island Art that further compliments the decor. You will be able to rest peacefully knowing you have 24 security. About The Owners: We are from Oregon. We love our Ocean, but prefer more sun. After visiting Hawaii several times, we discovered how invigorated we were by the Sunny Leeward side of Oahu. The surf at Makaha Beach can be calm and fun place to play or have dangerous waves that are so interesting to watch as surfers brave the immense waves. Recently, we tried Paddle Boarding at Po'Kai Beach while turtles and dolphins played right next to the surf board. We have many hikes and bicycle rides left to do in the Makaha area. We love the Saturday Morning Market (get there early), pick up fresh vegetables, fish for dinner, and coffee for breakfast . The Waianae Area feels like old Hawaii. We hope you will enjoy Makaha Valley Plantation as much as we do! Mark and Christina, Eugene, Oregon. We enjoy Swimming in the pool and watching the Kids play. In the evening we relax under a clear star-lit sky in the Jacuzzi. I love to Sit and Read and Watch the Peacocks, ducks, and many different birds and wildlife. We have spent many hours snorkeling off the reef at Makaha Beach and the little turtle beach at Aki Cove. Saturday evening you find at least 2 venues for live music nearby. Our relatives have enjoyed swimming with the dolphins at Makua Beach. We wanted to be 'off the beaten path' love the History of Hawaii and many beautiful beaches. Living in Makaha, life is pretty quiet but you can still get into a huge city within 1 hour if you want more excitement and world class dining. We find the availability of fresh local fish, poke, fruit and vegetables to enhances our diet. The hiking, biking, SUP, snorkeling are excellent. We have made many friends at the Makaha Valley Plantation. People are very open and friendly. We immediately fell in love with the view from our condo and impulsively purchased it. Having close access to unusual hiking and water sports nearby has been ideal. We are so happy that we can meet other interesting travelers from around the world in the Jacuzzi's on property. I love the Peacocks and wildlife on the well manicured lawns that make this property unique. View of the Waianae Mountains. Occasionally you will see waterfalls after a big rain. Expansive View of the Waianae Coast Line looking north and south. High End Sheets from for King Bed and 2 Twin Beds that Match the Decor. Beach Towels, Regular towel sets (bath, face, & wash). Plenty of dishtowels. All set for your home away from home! 6 Washers located in On-Site Laundry Building at the end of the parking lot at each building. Very Clean. 6 Dryers located in On-Site Laundry Building at the end of the parking lot in each building, very clean. One assigned parking spot next to the condo. Beach towels for all guests Washcloth, face and bath towels for all guests Kitchen towels included. 12 cup electric drip coffee pot, sugar provided. Cream may not be on hand. Purchase before arriving. salt, pepper, sugar, spices, small amount of coffee, some condiments, paper goods. New Full Size Refrigerator, Stove, Oven, Sink, Dishwasher, Toaster, Coffee Maker, Blender. Well stocked kitchen tools and herbs. Great Room with large 6+ dining table. Chairs for six. 2 flat screen TV's with local cable package, plus 2 BluRay DVD players Netflix streaming capable. BluRay able to stream Netflix, etc. Do not have HBO, STARZ, etc. Books on Hawaii, Hiking, Sightseeing Hawaii, some novels. Makaha Valley Plantation has lovely manicured lawns and gardens with the famous Peacocks, descendants from the Royal flock. They are protected in Hawaii. Very small lanai, can't put chairs on it. I recommend keeping sliding glass door open with screen closed unless too hot. Keep fan circulating. Available to rent in the Wainae Harbor. Very small lanai to stand outside and view the ocean and mountains. Makaha Valley Country Club. Public is allowed, reasonable pricing and they rent clubs, less than 5 minutes drive. Since you are on the third floor with no elevator, the condo is not accessible. You will love the pool area, beach sea life, Makaha Beach and Po'kai Bay. Also nearby Ko'Olina Resort has 4 wonderful protected swimming lagoons that are great for children and adults. Please respect this rule, only smoke outside, away from windows and doors. 6 Tommy Bahama Beach Chairs, Oversized Beach Umbrella, snorkels and masks, Beach Towels, Beach Mats, 2 Boogie Boards. Drying rack for wet swim clothes, Iron, Toaster, Electric Coffee Pot, rice cooker, Large Oval 6 seat Dining Table, Hawaii Travel Books and Maps. 2 flat screen TV's with collection of DVDs. Blu Ray DVD Netflix capable. WiFi available for cell phones and computing Ocean View: Expansive View of the Waianae Coastline looking north and south of the Hawaiian Princess (high rise building on the beach). Mountain View: Partial View of the Waianae Mountains. Occasionally you will see waterfalls after a big rain. Golf Course View. Share Family Style Grill in the Pool area. Gazebo: With the BBQ and Pool Area. This condo is super nice. The owners were super helpful, including giving us the name of the Lucky Owl car rental to save $$. The beds were super comfy, the kitchen well appointed, super clean and the pool, jacuzzi and bbq area had warm water and friendly people. This whole experience was easy and stress free. There are Peacocks around which we lived but they can be a bit noisy at night, but we will take that over city noise anytime. Great beaches nearby along with Longs drug, McDonalds and grocery stores. We would highly recommend this condo and the host. It was a great stay at Christina’s. There was lots to do and Christina had everything we needed at the condo. Makaha beach was great and the pool at the condo was nice too. Highly recommend it. A wonderful view of the ocean from the window. This condo was perfect and relaxing. The kitchen was well equipped, the bedrooms comfortable and the beach was close and never crowded. I fell in love with the area and it’s people and highly recommend this condo. Thank you for your kind words. We think the beaches and hikes are wonderful. It is our desire to make the condo as comfortable as possible. We just added a sofa bed to make it better for families. We look forward to seeing you again. The condo was excellent. We enjoyed the stay. You where right coming from Maui to Oahu was a downer but we still enjoyed. Aloha Dennis, Thanks for your review. Would like to say more about the condo. I know the weather was bad and of course we can't change that element, but did you find everything in the condo to your satisfaction? The beaches are fantastic on this side of the island. Unfortunately you had rain. A beautiful place to stay away from the crowds! The stay went very smooth, everything a host could supply was ready with the room. Great views of the sunset. Well cared for gated community. Grocery nearby. Beach is a bit far to walk, but 3 min in car with places to park. Would definitely stay here again, thank you! Aloha Eric, I am so glad you enjoyed our condo. The sunset views are the best. It is true that walking to the exceptional Makaha Beach is a bit of a walk. But if you are looking for exercise, I find it invigorating. However, like you, I take the care down and there is always a parking spot. There are many other swimming beaches along Farrington Road as well. I hope you return again to our little piece of heaven. Clean, well stocked and very secure ! Aloha Chuck, Thanks for your wonderful review. Since you live in this complex, you understand the area and find it and the resort amenities special. I am so glad that your daughter found the condo super clean and well stocked. We have tried to keep it for our guests like we like it. I hope I meet you sometime. We are on the island now at Aki Beach (March 8-31). Minutes to Famous Makaha Beach surfing, Snorkeling, scuba diving; Keana Point State Park with whale & dolphin viewing, tide pools, arches, rock formations, caves; Water-slide Park at Kapolei (15 mins); Lagoons at Ko'Olina-Marriott/Disney Hotel(15 mins). Please contact us for additional Hiking or Biking Trails! Also there are good Travel books in the condo for Oahu. Other Activities: Shopping, Kayaking, Para sailing, Wildlife Viewing, Basketball Court onsite, Tennis Court onsite, Boating, Shelling, fishing, swim with the dolphins. Whale watching, wonderful sunsets every night. Golf: Makaha Valley Country Club rents clubs, world class course with spectacular views of the ocean. Makaha Valley Resort closed for renovation.